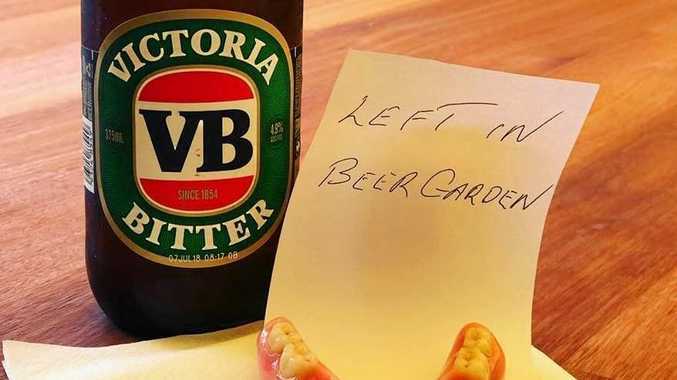 CLAIMED: These dentures were left at the Club Hotel in Bundaberg. BUNDABERG'S beer garden Cinderella has been found and the teeth fit. And the attached mystery - how do you lose your teeth at the pub - has also been solved. The owner of a set of dentures found at the Club Hotel has come forward to collect the item. After the NewsMail broke the story last week, news that a cleaner at the hotel had found the wayward chompers the morning after a big night went viral. It was covered by Channel 7 News, Fairfax Media, the Daily Mail, Yahoo News, the ABC and on Channel 7's Sunrise. During a live cross on Monday, Club Hotel owner Anthony Burrows told Sunrise hosts David Koch and Sam Armytage the owner had come forward. The man arrived at the pub on Thursday and asked to remain anonymous before collecting the free cold one the Club had promised the dentures' owner. He also explained how he came to misplace his teeth. "He did tell me that he very rarely wears them and he was there for a family affair and thought he would chomper up for the night,” Mr Burrows told the Sunrise hosts. Koch remarked that it was a "modern-day Cinderella story”, and Armytage said the story had come from the "Only in Bundaberg file”.